Make an Origami Crow for Halloween! 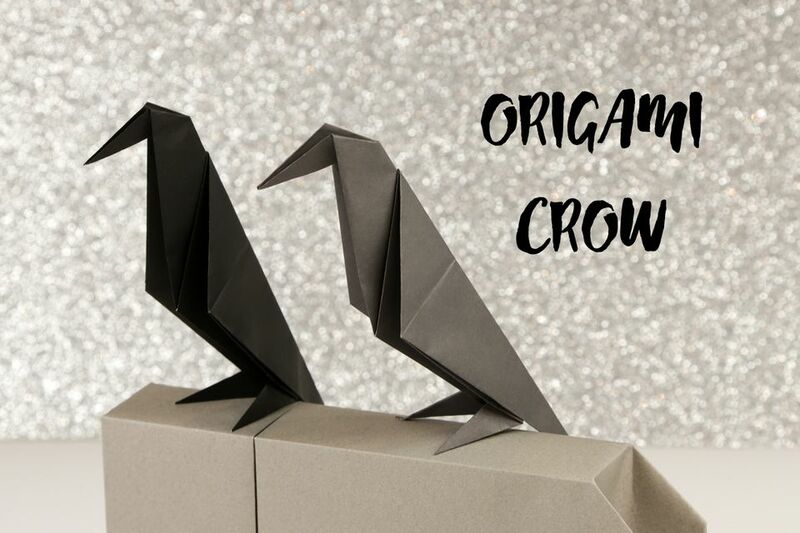 Learn how to make a simple traditional origami crow. This origami bird could also be a raven, black bird or other type of bird. What's nice about this origami bird is how it stands up. This origami crow makes a perfect decoration for Halloween! You could also decorate a Halloween greetings card with this little origami bird. You will need one sheet of square paper (preferably black on both sides) for this traditional origami crow. Looking for more origami birds? Check out the instructions for the Classic Origami Crane, Origami Pigeon, Origami Albatross or Origami Peace Dove. 1. Start with your paper white side up if you have one, however this origami crow works best if you use paper that is the same colour on both sides. 2. Fold you paper in half, from left to right and unfold, Next for it in half top to bottom and unfold. Flip the paper to the other side. 3. Fold the paper in half diagonally in both directions. You will be left with an X on your paper. 4. Flip your paper back to the other side. 5. Bring the left and right corners into the middle. 6. The top point will collapse down on top. 7. This should be what you have. This is called an origami 'square base' or 'preliminary base'. Starting with your origami square base you will be going on to create an 'origami bird base'. 8. Fold the the lower left and right edges to the central crease as shown. 9. Next, fold the top down over the top. 10. Unfold the sides, this is what you should have. 11. Now you will be reversing the left and right creases you just made. 12. Open out the lower section and reverse the folds, bringing the bottom point up to the top. 13. This is the result. 14. Repeat the process on the other side. This is the completed origami bird base. 15. Fold the two bottom points up the central horizontal crease. These will form the legs. 16. Fold them both down and out to opposite sides. 17. Unfold the last step and reverse fold the the feet. 18. This is the result. 19. Flip the top section of the 'foot' down. 20. Repeat the last few steps on the other 'foot'. 21. Fold the top down. 22. Flip the model over to the other side, from left to right. 23. Fold the model in half. This is the result. 24. Fold the 'head' down to a good angle. 25. Open out the top and reverse the fold there. Now your traditional origami crow is finished. You can stand him up on a ledge as long as there is room for his tail! How to Make a Traditional Origami Star Box! Learn How to Make an Origami Square Hanging Decoration! How to Make an Origami Sailing Yacht! Learn How to Make a Cute Origami Sail Boat! How to Make an Origami Cootie Catcher! How to Make an Easy 5 Point Origami Star!